Go Go’ers, it’s been a helluva decade. Ring it out in style at one (or if you’ve got the stamina…ALL!) of the following Downtown palaces of drinks, delight and debauchery. THE BIG TICKET: “1 Ticket, Eight Open Bars” is 213 Downtown L.A.’s promise to help you welcome the New Year in style. You’ll want to wear your high-heeled sneakers for this celebratory crawl! GRAM RABBIT on stage and well spirits +11 craft drafts and wine in your hand. Indie Big Sonic Heaven DJ Darren Revell and Kapsoul rock the casa. Party like it’s 1999! DJs B-Mix and J-Cru spin 80’s, Disco and Funk while you patronize the all-night open bar on all well products. Get your champers on at Cole’s. Open Champagne Cocktails Bitter Bar featuring cherry, chocolate, mole and other libations made with your choice of housemade or branded bitters. Drink in the decade like Papa Hemingway with Cana’s Daiquiri Bar. Fresh handcrafted cocktails served throughout the night while Icy Hot Club serves up vintage gypsy jazz with a modern twist. ***Go Metro — Holiday Service FREE all night so no need to drink and drive, Go Go’ers! ***AAA Tow Service — AAA is offering free towing for the 14th year in a row. Between 6pm and 6am December 31 to January 1, call 1-800-400-4AAA and ask for a “tipsy tow”. This does not include rides for passengers, and is a one-way tow up to seven miles. Anything after seven miles will be charged at normal rates. You do not have to be a member of AAA to use the free towing. Previous Post More ginger cocktails to spice up your holiday party PLUS Ms. Go Go writes elsewhere! Next Post Fatty’s “Last Supper” – exclusive! 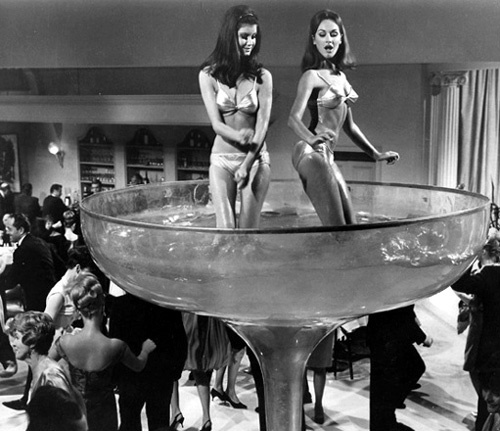 Hey…where did you find that old picture of you and me dancing in the champagne glass? Those were the days. Have a gorgeous New Year, Kim! May all 2,011 of your wishes come true! I agree, Mme. Pamita! Nothing says “festive” like sticky girls in shiny bikinis! One *hopes*they’re in faux bubbly but yes, not for human consumption! Here’s to a decade of health and happiness! Now that is some groovy photo. You always have to flaunt it, don’t you Ms Go-Go? Those shiny leatherette bikinis…HELL to wash!